The Moroccan term for a marinade is chermoula, the most classic of which is a zesty marinade of paprika, cumin, garlic, herbs, olive oil, and lemon juice. 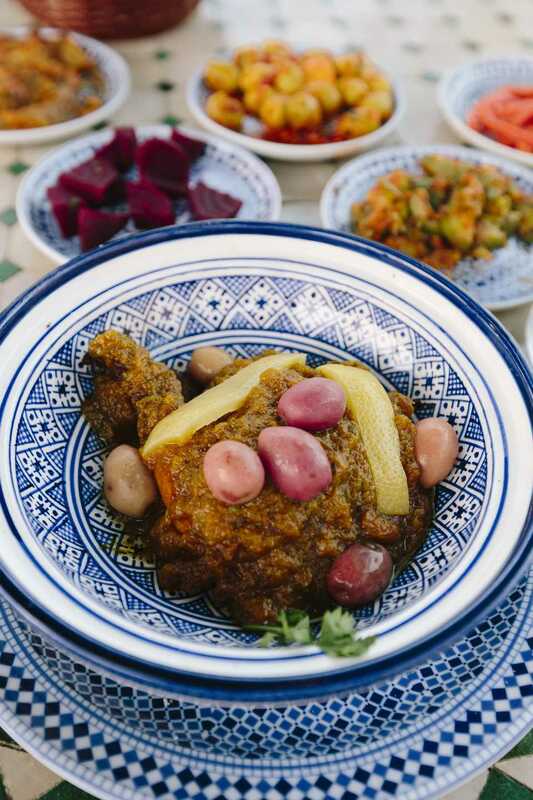 It's famously used with fish, but it may also be used with chicken which can then be grilled, or as is the case here, stewed in a conventional pot or tagine. The term djaj mchermal, then, is in reference to marinated chicken, but it's a term that has come to be associated with this particular presentation with onions, preserved lemon and olives. It's best to allow time for marinating the chicken. Allow longer cooking time if preparation is in a tagine. Combine the onions, garlic, herbs, spices, olive oil and lemon juice in a heavy-bottomed pot or tagine. A deep skillet or Dutch oven can also be used. Add the chicken pieces, stirring to coat it well with the seasoned onion mixture. If time allows, cover and refrigerate for several hours or overnight; otherwise proceed to the next step. Place the pot over medium heat and bring the mixture to a simmer. Note: If cooking in a clay or ceramic tagine, add 1/4 cup water and allow the vessel to come to room temperature before proceeding; use a diffuser if cooking over a heat source other than gas. Cook the chicken, stirring and turning the chicken from time to time, until the chicken is tender but not falling from the bone. This will take about an hour in a conventional pot but often longer in a tagine. Don't add water unless you feel it's necessary, and even then, use only a small amount. Remove the chicken to a plate and cover with aluminum foil to hold warm. Continue cooking the onion mixture over medium-low heat, another half hour if necessary, until the onions have softened and can be mashed into a thick, uniform mass. Watch carefully so they don't burn. Return the chicken to the pot and add the preserved lemon, olives and a few tablespoons of water. Bring the sauce to a simmer for about 10 minutes, or until the chicken is heated through and the rich sauce has been flavored to your liking with the preserved lemon. Serve the chicken directly from the tagine, or if prepared in a pot, transfer it to a platter. It's traditionally eaten by hand using pieces of crusty Moroccan bread in place of utensils.